Well if that performance didn't get you moving, you might want to go to the doctor because you're probably dead. 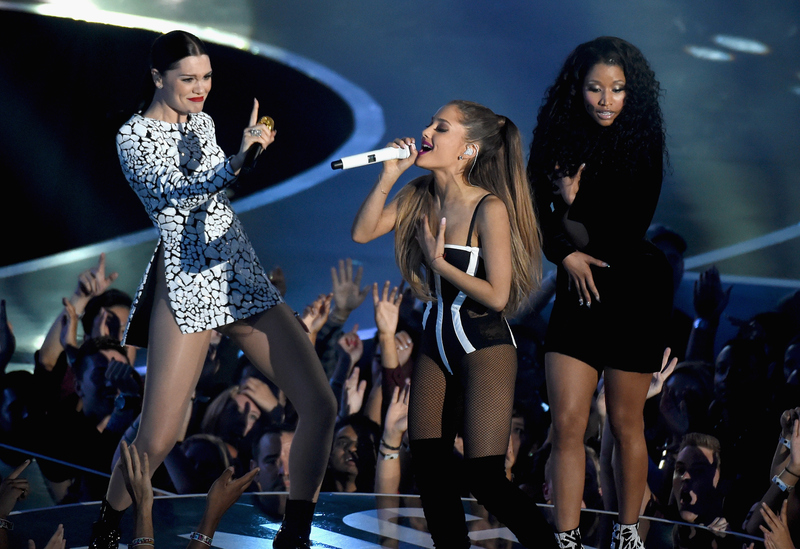 At Sunday night's American Music Awards, the telecast received a MAJOR boost of energy thanks to Jessie J, Ariana Grande and Nicki Minaj's performance of the monster hit "Bang Bang," showing everyone the three female artists are pretty much perfect in every way. Ariana Grande had already performed once earlier in the telecast, doing a stripped down version of her hits "Problem" and "Break Free" and then teaming up with The Weekend for her performance of "Love Me Harder." But her night was boosted even more by the powerhouse that is Jessie J as the duo teamed up to sing their big hit of the summer "Bang Bang." Thankfully, Nicki Minaj also joined the performance, and the trio went crazy with Nicki's attitude and Grande and Jessie J blasting audiences with their voices. Seriously, with all of the belting these two ladies do, it's almost impossible that they're not completely hoarse the next morning, right? If they are not, they've definitely sold their souls to the devil or pulled an Ursula from The Little Mermaid and stole their incredible voices from a pair of beautiful, now silent sea creatures. The performance began with Jessie J taking the most badass stances in the audience and belting her face off while dancing with Khloe Kardashian, Sam Smith, and then Taylor Swift and Lorde who also joined in singing along with the British artist. She commanded the audience and sent the camera up the stage with Ariana Grande who sat in a chair in a sultry fashion and proceeded to bring down the house even further. By the time Nicki Minaj joined the singer, it was a surprise to see that the ceiling hadn't fallen through from sheer awesomeness. Here's the thing though, it was never a surprise that these ladies would bring the house down. I mean, they've done it every other time they've performed the song, including at MTV's Video Music Awards even though Nicki Minaj experienced a bit of a wardrobe malfunction. This was no surprise but it was still a freaking pleasure to witness again.